Tania's article on short stories in Bellatrista magazine. Tania's guest blog post on writing and not-writing on the Strictly Writing blog. Tania's guest blog post about getting published by a small press on the How Publishing Really Works blog. Tania admits the truth about her writing routine (as it was last year) in a guest blog post on Branta: The Might of Write. Tania is currently fiction-writer-in-residence at Bristol University's Faculty of Science. She is also fiction editor of Southword magazine, and a judge of the Bristol Short Story Prize, the Brit Writers Awards and the Sean O'Faolain Short Story Competition. Kate Wilson says: "From the opening pages, I couldn't stop reading. Each story pulls you in with its meticulous detail. While Hershman creates fantastic plots and imaginative inventions (the machine that can destroy rain clouds or the sinister tracking devices being planted in clothes), she also has an extraordinary ability to convey deeply meaningful and profound moments in the same way poetry does.. At times it felt like reading the best of Alan Lightman." I can't think of a greater compliment! Read her full blog post. Book reviewer RobAroundBooks is slowly working his way through The White Road and Other Stories. Of the title story he says: "Lyrical in her prose, and patient in her build up, Hershman drops little caveats throughout the story which not only suggests to the reader that all is not as rosy as it seems, but that story is leading to some dramatic event. All is not as rosy at it seems, and the story does lead to a dramatic event, and it’s a wholly memorable one at that. Highly recommended!" Read more on the Reviews page. The White Road and Other Stories has received a very nice review in Flash magazine (print only). Two new reviews: Alison Wells says on her blog: "As a reader I read in open-mouthed awe and joy, as a writer I writhed with envy. This is a must read collection" and Jim Murdoch writes in his well-researched article and review: "So what did move me? Well for me it was the title story as I’ve said. It’s not long – 7½ pages, a touch over 2000 words – but it was the perfect length for me. I recommend you read it right now. It’s online here..." Read more on the Reviews page. A week of Tania's flash stories - many of which are from The White Road and Other Stories - are being broadacst on BBC Radio 4's Afternoon Reading! They will be broadcast on Tues June 29th, Wed June 30th and Thurs July 1st, 3.30-3.45 pm UK time, and then available for 7 days afterwards online. A new review, in The Huffington Post: "A remarkable thing about The White Road and Other Stories is that for all that there are over twenty stories in this collection, each character possesses a distinct voice, molded by childhood histories and informed with deep-rooted desires and loves. Where the story concepts begin with science, fiction becomes a laboratory for examining the most intimate secrets of the human heart," says Ilana Teitelbaum. Read the full review. A new review, in A capella Zoo, Colin Meldrum says: "The White Road became engrossing on second read. The even better news is that the allure of this pleasure warmed me up to some major pows that I had somehow missed a year before... Now I can whole-heartedly recommend these stories." See the reviews page for more. The eBook of The White Road and Other Stories is due for release soon. Stay tuned! Mugs is included in the 100 Stories for Haiti fundraising anthology. Buy a copy, all proceeds donated to help the victims of the Haiti earthquake. Tania read Plaits at the Short Fuse hair-themed reading event in Brighton on March 10th. Exchange Rates, a play Tania adapted from her short story, published in The White Road and Other Stories, won the Total Beast 6-minute play competition,. It was performed, together with the other shortlisted entries, in London on 31st January 2010 at the Bridewell Theatre. Exchange Rates, a play Tania adapted from her short story, published in The White Road and Other Stories, is a finalist in the Total Beast 6-minute play competition and will be performed, together with the other shortlisted entries, in London on 31st January 2010. For more details, click here. Tania will be a guest speaker at the Arvon Foundation's Totleigh Barton centre in Devon, and at Bath Spa University. The short screenplay Tania wrote based on the story North Cold from the book is a finalist in the Waterford Film Festival Short Screenplay competition. Bookmunch says: "Hershman has a keen mind, can concoct the sort of slippery knot that hooks you, that has you turning pages to see what happens next (which is rare in short story land, or at least in the short story land I’ve visited).." See the reviews page for more. A new review over at PANK magazine: "The eponymous story of this collection is worth the price of admission. It is, without a doubt, one of the best short stories I’ve ever read." See the reviews page for more. Happy First Birthday to The White Road and Other Stories! In honour of the book's first birthday, Tania is giving away three signed copies on her blog, TaniaWrites. If you haven't already bought a copy, head over there to win! Following on from Salt's Just One Book campaign persuading people to buy a book to help save this wonderful and dynamic small independent publishers, my book is currently top of the Salt bestseller list! Please keep supporting Salt, there is a 33% discount on all books throughout August, enter coupon code HU693FB2 when you checkout. Along with 56 other short story collections, The White Road and Other Stories has been longlisted for the prestigious Frank O'Connor International Short Story Award, last year won by Jhumpa Lahiri for her collection, Unaccustomed Earth. Matthew Firth says: "The White Road may not be hard-hitting short fiction but it shows there is more than one way for writers to separate their work from the pack of safe and boring mainstream writing. Props to Hershman for showing readers that not all short fiction is dull and formulaic.". See the reviews page for more. I am one of two writers commended in the 2009 Orange Award for New Writers.﻿The judges said: "We would also like to commend Tania Hershman ...whose work stood out for its remarkable quality. We look forward to seeing more of [her] writing in the future." Jeremy Page says: "The short short story is Hershman’s preferred form, and there are some very short shorts in this, her debut collection. For the most part her experiments are a resounding success". See the reviews page for more. In her review, Sally Zigmond says: "As I now read more novels than short stories, I had expected to prefer the longer stories in this collection to the flash fiction (as some reviewers have) but to me the longer ones were either too long or too short--not quite right for this Goldilocks. The flash fiction, on the other hand, I loved for its brevity, its inventiveness and its poetic quality." See the reviews page for more. On his blog, Matt Bell says: "The White Road is a very fine collection, containing enough wonder and humor and heartbreak to overflow its slim pages, forcing the reader to share in the great emotion contained within. Hershman's talent is obvious, and I look forward to seeing it continue to grow across whatever new stories and new books might follow this excellent start." See the reviews page for more. Dominique Wilson reviews The White Road and Other Stories, saying: "This collection exemplifies everything that is best about the short story. With succinctness rarely seen in the work of someone new to fiction, Hershman extracts the very essence of a moment to reveal the poignant fragility of human relationships". See the reviews page for more. available to listen to online. of the session is now available on JewishBookWeek.com. Hags, Harlots and Heroines. Visit the reviews page for details. her virtual book tour. For information on the tour, click here. "She weaves the warbly, neon threads of magical realism together with the steel rods of science, and the effect often is very satisfying." Visit the reviews page for more. Dec 29rd: Tania is visiting Botswana on the tenth and penultimate "stop" on her virtual book tour:Lauri's Thoughts from Botswana blog. For information on the tour, click here. The White Road and Other Stories is reviewed on Pulp.net: "A clever, warm and thoroughly recommended debut.". Visit the reviews page for more. Dec 23rd: Tania talks to Marianne Villanueva on the ninth "stop" on the "Walking the White Road: flash, fiction and science" Virtual Book Tour: Kanlaon. For information on the tour, click here. Tania is interviewed by Smokelong Quarterly about her flash story, Coat and Shoes, published in the latest issue, and about writing in general. New Scientist has included The White Road and Other Stories in its Christmas Books Special: Best of 2008, and the reviewer says: "Inspired by scientific progress and science journalism and driven by an author dripping with talent, this is as good as modern reading gets." Read the full review. Tania talks about the environment, libraries and her typical day on the seventh "stop" on the "Walking the White Road: flash, fiction and science" Virtual Book Tour: The Eco-Libris Blog - and there is a giveaway of a free copy of her book! Exchange Rates, the short play Tania adapted from her story of the same name, which is included in her collection, has been shortlisted for the Total Beast Six Minute Play competition and will be performed in London, with the other shortlisted plays, in 2009. Tania is On the Couch, talking about short stories and literary influences on the sixth "stop" on the "Walking the White Road: flash, fiction and science" Virtual Book Tour: Eric Forbes' Book Addict's Good Books Guide. For information on the rest of the tour, click here. 26th Nov: Tania talks about fiction and genre on the fifth "stop" on the "Walking the White Road: flash, fiction and science" Virtual Book Tour: Tim Jones' Books in The Trees blog. For information on the rest of the tour, click here. 18th Nov: Tania talks about fiction and religion on the fourth "stop" on the "Walking the White Road: flash, fiction and science" Virtual Book Tour: Sue Guiney's blog. For information on the rest of the tour, click here. 13th Nov: Tania is named European regional winner, the Commonwealth Broadcasting Association Short Story Competition 2008-9. Listen to her winning story here. 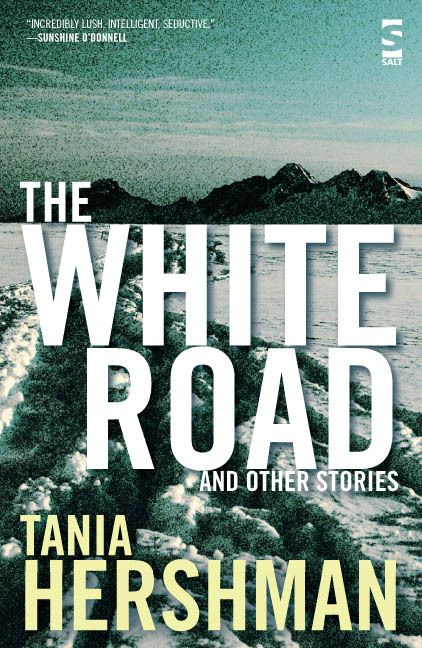 9th Nov: Tania visits the third "stop" on the "Walking the White Road: flash, fiction and science" Virtual Book Tour: Vanessa Gebbie's News blog, for a discussion on magical realism. For information on the rest of the tour, click here. 7th Nov: Tania is interviewed in the Jewish Chronicle. 5th Nov: The "Walking the White Road: flash, fiction and science" Virtual Book Tour reaches its second stop on the LiteraryMinded blog. For information on the rest of the tour, click here. 28th Oct: The White Road, was reprinted by New Scientist magazine, the science weekly whose articles inspired half the stories in her collection. Read it here. The "Walking the White Road: flash, fiction and science" Virtual Book Tour kicks off on the Keeper of the Snails blog with a discussion on science in fiction. The Frank O'Connor International Short Story Festival 2008, Cork, Ireland, Sept 2008. Visit the Stories page to watch Tania reading two of the stories from her collection at the festival..